Smart Shepherd is a founding member of the University of New England's SMART Region Incubator, funded by the NSW Government's Boosting Business Innovation Program. The company won an AgFunder Innovation Award at the World Agri-tech Innovation Summit in San Francisco. Smart Shepherd was one of 13 companies from around the world to win awards across four categories at the AgFunder Innovation Awards picking up the prize for the 'Most Innovative International Startup Pre-Series A'. The company, founded by David Rubie and Glenn Vassallo, has developed a technology system for sheep farming to track the maternal pedigree of lambs, but it can also be used by cattle and goat farmers. 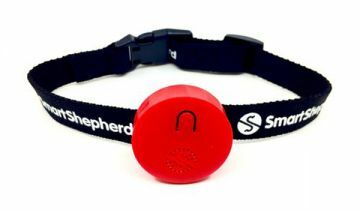 The system uses a bluetooth smart tag which is attached to livestock using a quick release collar or an ear tag, work without GPS or internet connection – the tag is also waterproof and sturdy allowing it to be used anywhere. The tags are attached to the mothers and offspring of a livestock herd for at least two days after which they are collected and data is retrieved. The system fills an information gap by giving farmers maternal characteristics of their animals, showing which mothers are best for productivity and animal welfare outcomes. The NSW Government's Boosting Business Innovation Program is providing $18 million to the state's 11 universities - including the University of New England - and the CSIRO to work with local businesses to boost innovation.